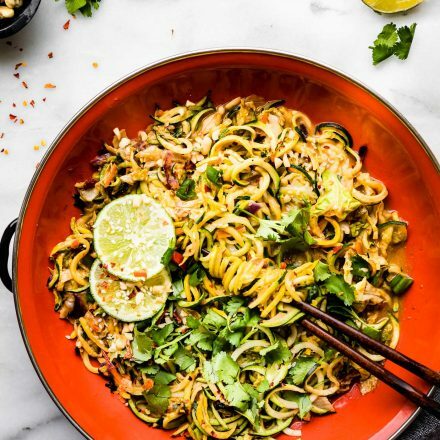 Quick Asian Zoodle Flu Buster Soup! 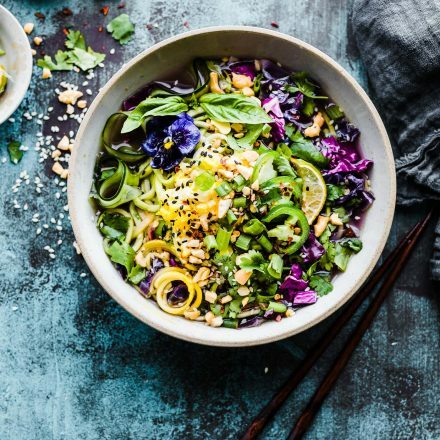 This Asian inspired paleo zucchini noodle soup is light yet rich in anti-inflammatory properties. A soothing delicious and nutritious soup. Vegetarian and Vegan options! Come now, get healthy! This is one of those recipes I selfishly made for me. Plus it was an excuse to come up with a fun recipe title. 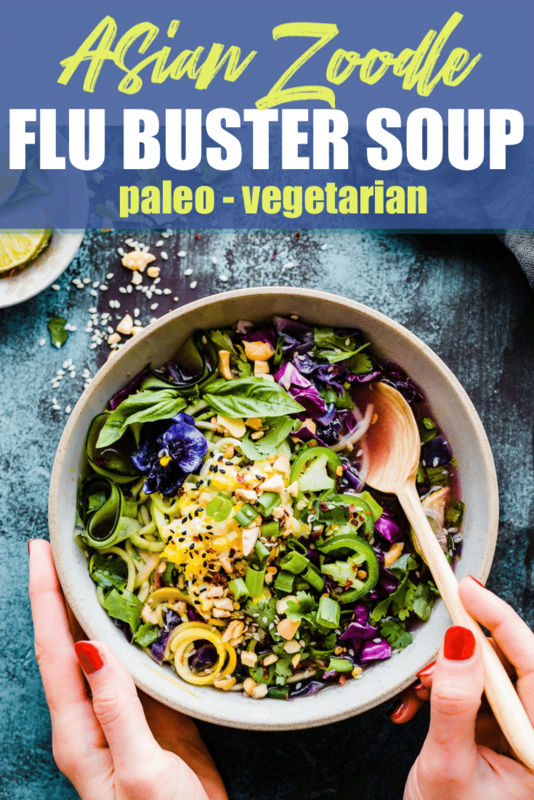 Asian Zoodle Flu Buster Soup! NO FLU or BUST! I hope you will thank me for it later, selfishly. Haha! You see, food is medicine (healing) and I so needed the extra meds these past few weeks. I *might have* overworked myself. But the two snow storms that randomly passed through Utah also didn’t help. Therefore, it was time. Time for something warm, spicy, and soothing to help me (us) thrive during cold and flu season! You feeling it? Of course you are! I get really excited every time I create a recipe that serves two purposes. To heal and to taste AMAZING! This Asian Zoodle Flu Buster Soup is just that, and it involves some of my favorite flavor combos. Cilantro and fresh ginger AND spicy peppers? Yes please! Guys, it’s winter! Our immune systems are working over-time (or in my case, under-working), and if you’re like me, you get anxious every time you sneeze or feel a slight tickle in your throat. I start echoing in my head “I will not get sick, I am not sick, I must not get sick.” Hey, sometimes it works, right? Either way, I’m determined to do everything I can to take better care of myself this year, which is why I love this Flu Buster Soup. Buster, it should be my new word for 2018. Haha! But I digress… let’s talk about the Asian Zoodle part, mmm k? 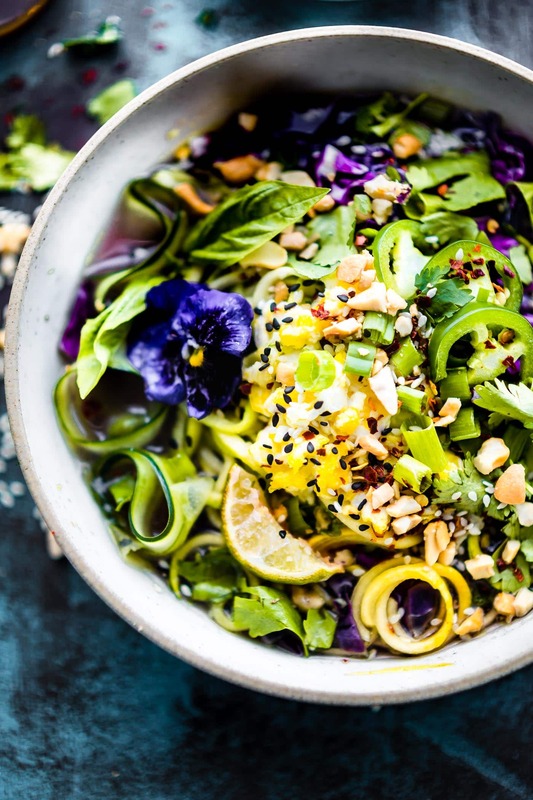 It’s both flavorful and comforting, and I’m a little obsessed with the crunch of the cabbage and cashews combined with the tang of lime juice and ginger. 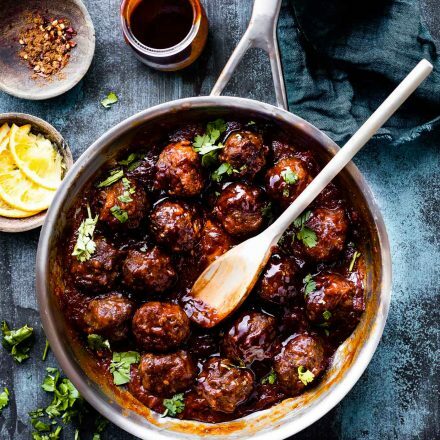 Most importantly, it’s filled with delicious ingredients like fresh Asian peppers and cilantro— foods known to boost your immune system, reduce inflammation, and keep you healthy and strong all winter long. 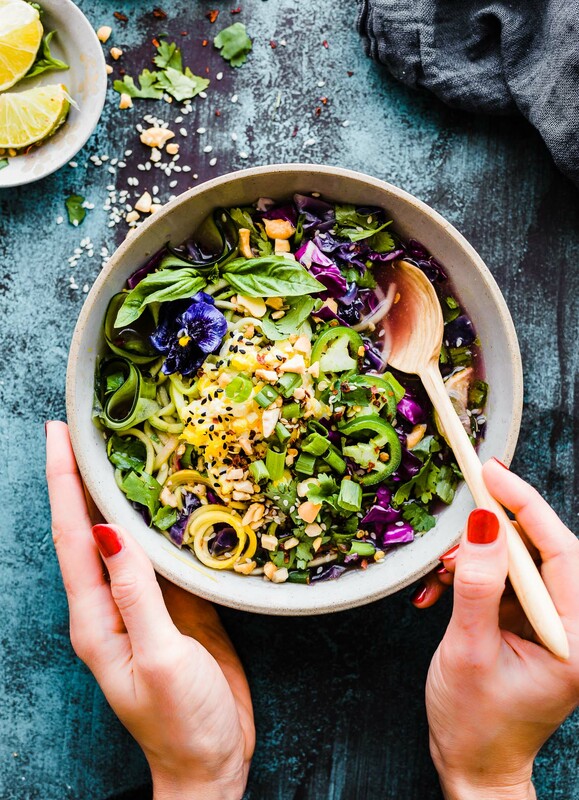 Inspired by traditional soups from Malaysia with heart-healthy updates like low-carb zucchini noodles, sinus-soothing peppers, and infection-fighting cabbage, this truly is the perfect flu-buster recipe. Added bonus, it’s quick and simple to make, and your kitchen will smell amazing the entire time you cook. 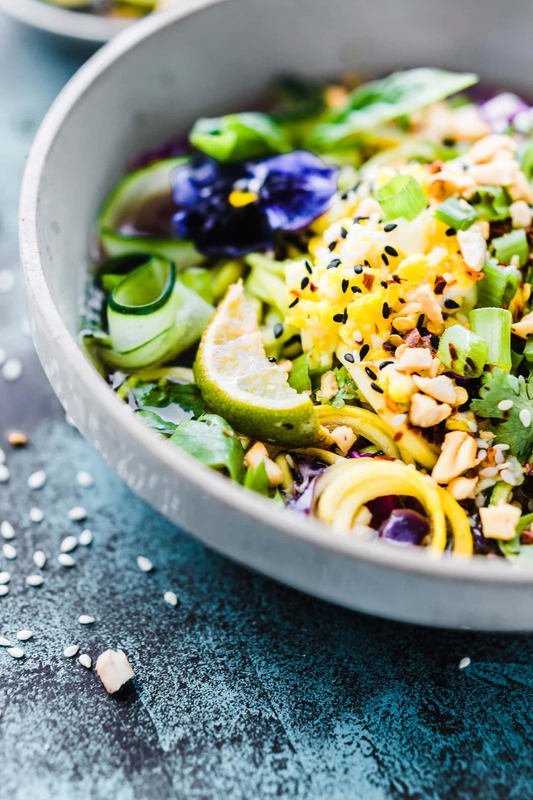 Spiralized zucchini and yellow squash: did you both know zucchini and yellow squash contains both antioxidants and healing properties that help reduce inflammation? It’s not just low-carb, it’s also a great digestion aid, and a good source of energy-boosting B vitamins. Freshly grated ginger: I’m in a long-term relationship with ginger, it’s easy to incorporate into almost any soup, and adds that sweet and sour tang we all love in Asian-inspired recipes. Added bonus? Ginger is scientifically proven to help fight colds, reduce nausea, and reduce joint pain. Purple and/or Red cabbage: protects the body from infection and acts as another flu-busting anti-inflammatory. 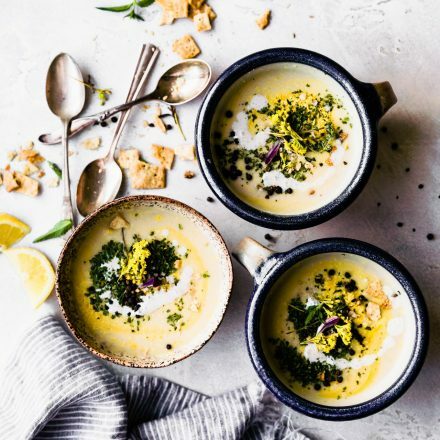 I also love the pop of color it adds to this soup, proving once again that healthy food can taste great and look pretty. Asian or jalapeño peppers (I’ve used both! ): A powerful natural antioxidant with plenty of Vitamin C to help the body absorb iron. 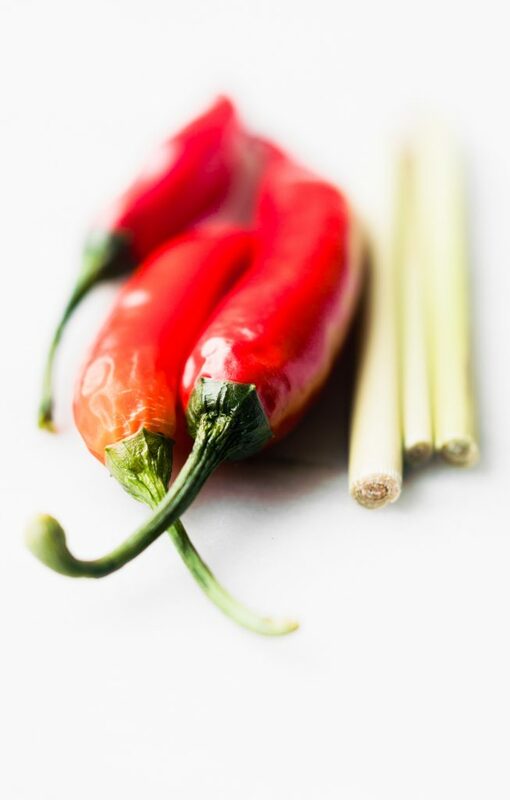 The added spice doesn’t just taste good, peppers are also an energy-boosting source of B6! Cilantro: helps remove toxins, improves digestion, and protects against heart disease. Staying healthy never tasted so good. BONUS –> Black sesame seed. An excellent source of minerals, B Vitamins, and fiber. The edible flowers? Well, those are just pretty but I bet they have some health perks. 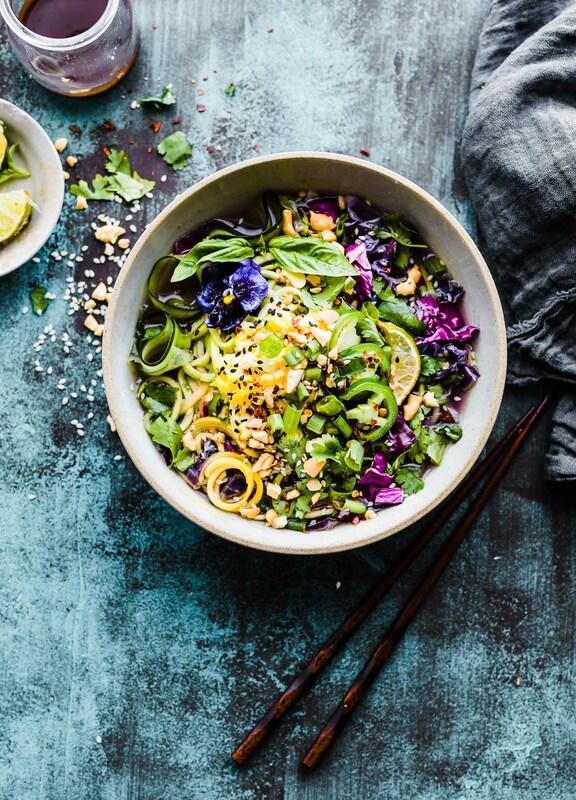 This Asian inspired zucchini noodle soup is light yet rich in anti-inflammatory properties. A soothing delicious and nutritious soup. 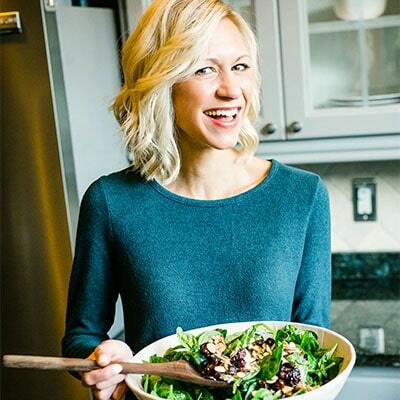 Gluten free and paleo, with vegetarian and vegan options! Crushed salted nuts (cashews, almonds, or peanuts work great). 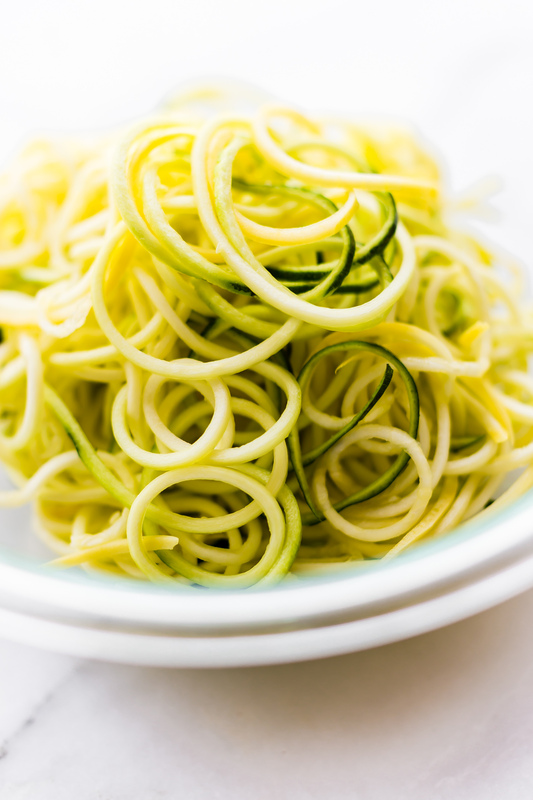 First, clean your zucchini and either spiralize or julianne cut. Press the zucchini between 2 paper towels and remove excess water. Place in a bowl for later. In a medium sauce pan, heat the sesame over medium heat, add in your shallots, garlic, ginger and stir fry until lightly browned. About 1- 2 minutes. While that is browning, crush your fennel seeds. I did this with back of a knife. You just want to crush the fennel seeds to extract more of the flavor. Add in the crushed seeds, cumin, anise, 5 spice, salt , broth, pepper and salt. Bring to a boil, stirring occasionally. Mix in your fish sauce and optional chili sauce. Next, add in chopped cabbage and simmer until the softened, about 2 to 3 minutes. Add the zoodles, and bring to a quick boil again. Then reduce to low and simmer for another 2 minutes or until everything is cooked though and the broth is to your liking. If you are adding egg as topping, do so now. Quickly scramble an egg in a small skillet or fry in 2 tsp oil. Spoon soup into soup bowls and top with extra crunchy raw cabbage and cooked egg. Garnish with sliced jalapeño or Thai red peppers, chopped cilantro, diced green onion, lime wedge, sesame seeds, crushed nuts, sea salt and black pepper. Feel free to try this with any spiralize vegetable, just check for doneness when you add the noodles to the broth. Some vegetable take longer to cook. Vegan option – Use Tamari sauce instead of fish sauce and omit Egg. You can replace egg with cooked sprouted tofu, chickpeas, or even tempeh. Estimated Nutrition for 3 servings, with egg and sesame seeds on top. Sodium is 850mg. Reduce sodium by using low sodium tamari and broth. What’s your favorite flu buster soup? I’ll gladly take more recipes! Where was this soup last week?? They look amazing and the ingredients sound delicious. That they help me stay healthy is just an added bonus!! So wish I had this a couple weeks ago! 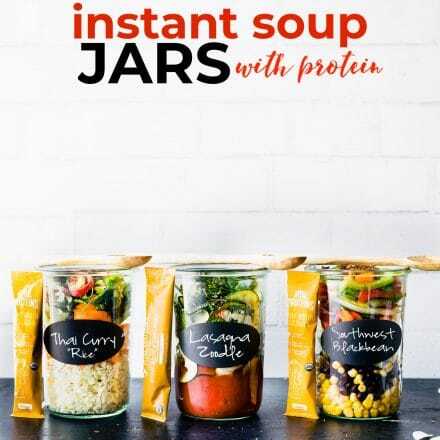 My little guys love soup, and I would feel so good making this for them. Especially during flu season! I need this SO badly right now. Not that I’m sick, but I feel so run down from all of the moving and stress. Whew. I can’t get it together lately! Adding to my list to try whenever I have a kitchen again. Bro! I would so deliver if I could! The move will be worth it. I know it! Love all the descriptions of the superfoods you provided! The colors of each ingredient are absolutely magical. I don’t have the flu, but I’d still enjoy this in a heartbeat! so thought of you! minus the egg, this is your kind of soup! Pressure Cooker Chicken Soup. 4-6 frozen bone-in chicken thighs (use frozen). 1/2 onion. 3 whole garlic cloves. 3 halved celery stalks. 2 tsp salt. 6 cups water. 1. place all ingreds into pressure cooker. 2. Set on high, 45 mins. slow or fast release. I have done both. 3. While chicken cooks, in a stock pot, in 1/4 cup butter or more, sauté 1 large diced onion, 3 diced carrots, 4-5 stalks of celery plus leaves (an herb) and any other veggies you wish to use. 4. Remove thighs to a plate, toss vegs. from pressure cooker, they now have no taste. Pour stock into soup pot. Add 6-8 minced/grated cloves of garlic. Add chicken to pot. I just ate the last of the soup tonight. Taste and season. The pressure cooker replaces hours of boiling. I also use same recipe to make Chicken & Dumplings using 2 cans of woompuns (can biscuits, grand size, cut each biscuit into 4 pieces and while broth boils, drop biscuits in. My family thinks I’ve slaved over a hot stove for hours. Bahahaha…I am under the weather right now. This sounds awesome! Thanks Laura! You’re amazing and I want a bowl of this soup in my fridge and freezer at all times, for every single throat tickle or cough for me and the wee babe. She loves hot sauce, so I’m sure she can handle the heat. The Hubby planted a whole slew of edible flowers last week and on the seed packets, it tells you the health benefits. OMG really? your hubby is smart. What a great styling tool. And you’re amazing! Always! 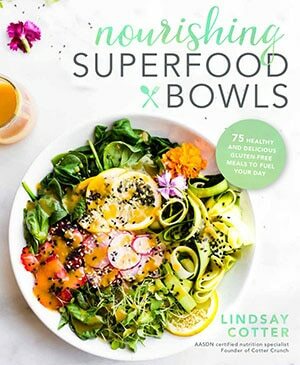 I need this nourishing soup and that bowl! I’ll share with you any day! This is so something I need right now! Looks delicious! Flu or not, I want a bowl of this goodness! So beautiful too!